The demise of the “Daily Post” has left me feeling a little bit lost. Like many WordPress users, I used the “Daily Prompt” for inspiration rather than a resource to find other blogs. I recently purchased a ‘Personal Plan’ as opposed to a free plan, with the intention of using the Daily Prompt, as what I felt it’s purpose was, to encourage me to write more. My reasoning was that if it cost me money, then I would use it more. I often tell people, when they ask what my blog is about, that it’s about “… what I want to share, when I want to share it …” There is no basic theme running through it, except when I wrote many posts about my heart operation back in 2014. I have thought about writing about a specific topic, but never got much further than thinking. So, where now? Where will my inspiration to blog come from? I have had a look at some of the so called ‘Blog Generators’ but none of them seem to be a fit replacement for the Daily Prompt. I looked at the WordPress ‘Discover’ site but the thought of selecting my best post and ‘pitching’ for a random chance of blog promotion seems a bit alien to me. I don’t feel it is up to me to decide which is my best post. My readers will decide that. If anyone knows of a place that does a similar type of thing to the Daily Prompt, I will be very grateful if you would share it with me. I have decided. There shall be NO single theme in this blog. There are a few reasons, but the main one is that this blog is just me. I started it as a means of practicing my writing. The intention was that I would mainly read other writers posts and glean what knowledge and tips I could pick up to improve my writing and use that to post my own work. That part of the plan is still working, but to post my own work, I have to do some! Today it’s “Let’s Rip Off People By Pretending We Care About The Romantic Things In Life When They Have Just Started To Get Over Christmas” Day. Or as it is known “Valentines Day.” To be accurate it’s actually Saint Valentines Day, but in this day and age of religious intolerance, people tend to forget the ‘Saint’ part. It is just a money making con by retailers, to encourage people to part with money that they don’t probably have. You may have guessed by now, that I’m not a fan! I shall leave it there! One of the things I said I would do when I retire was to clear out some the junk we have horded over the past twenty (call that forty) years. The loft is ridiculously full of said junk, and the garage is not far behind. I took some stuff to the tip last week and yesterday spent a couple of hours trying to identify what we wanted to get rid of. I found a bag full of trousers. Some of them were mine that had mysteriously shrunk over the years, particularly in the waist area. I don’t know how that happens at all! Some of them were new pants that K*** had bought for R*** in the sales and such. This brings me, in a round about way to the sizing of some of those clothes. I was ironing some of them this morning and was making a note of the leg length. Four pairs had an inside leg measurement of 29”, but they all seemed to be different lengths. Out with my trusted tape measure, and I find that one pair is indeed 29”, but two pairs are 31” and one was actually 32”. All were from the same store and all the same style. Then to cap it all, another pair had a size of ‘15 years’! How do they measure a size by a persons age? When I was 15, I was just a little over 5ft. Most of my class were around the 5ft 6in, but there was at least two, maybe three guys who were over 6ft. I really do get a bit frustrated and angry with how clothes are sized. 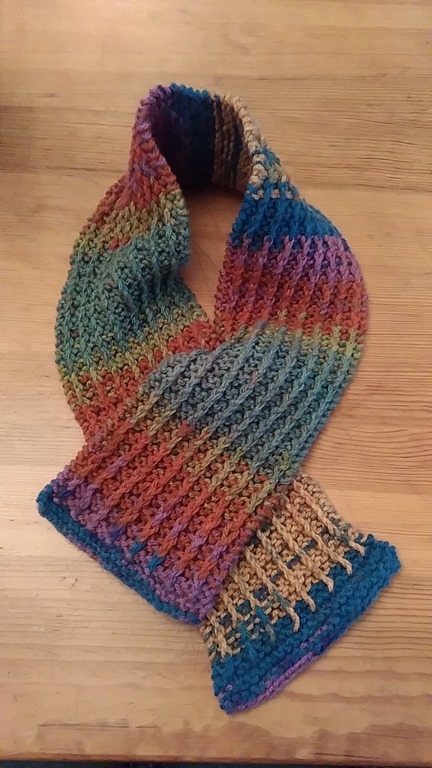 To finish up, this is the latest of my knitting ‘projects’. It’s a simple scarf that I have been on with for a couple of days. It was an easy pattern to work with and I thought I would share it with you. As I mentioned earlier, I’m not going to have a theme for my blog, and I’ll just throw in things like this whenever the fancy takes me. Why do they have to be ‘projects’? It’s just a hobby. I think I ‘ve found it ….. 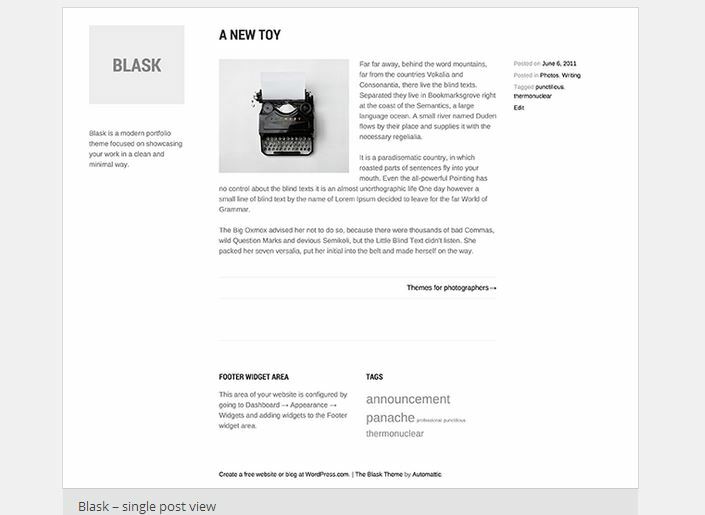 I have been looking for a new theme for this blog for sometime now, and I think at last that I’ve found it.Those generous people at WordPress have released a new theme called Blask. I have to do a full test, but on the surface, it seems to tick all the boxes. It is minimalist and looks very clean and professional. Well if you follow the above link, you can see it for yourself. So at some point over the weekend, I will be taking this offline whilst I do a full test of this new theme. Nothing of real interest here. I have finally taken the plunge and changed my theme. I’ve been thinking about it for a while and it came to a head this morning, when I tried to add an image to a post. Everything I tried seemed to show the image with a solid grey border around the edge. It was not a good look, but I could not find anyway of stopping it from happening without editing the text and changing some the coding that was in the background. Now, I was intending to have an image in each new post as a motivational prompt for writing. Having to mess around with coding, was not going to make life easy, and I was resigned to having to make do with what was on offer in the theme. It was only later this evening, whilst reading another blog, that I noticed the images in their blog looked exactly like the images should look. A bit of detective work and lo and behold, I’m now using the Penscratch theme as opposed to Twenty Ten. I suppose I really should have done some research and found a theme that showed images properly, but I felt sure that there was something I needed do to the image is the setting to make it look right. Unfortunately in twenty Ten, there was nothing I could do, it was either ‘like it or lump it’ as the saying goes. The only downside that I can see with this new theme, is that I cannot add an image to the title bar. However, a small price to pay, to get the right effect. I have to say though, it’s been good fun trying to get this new one looking the way I want it, so keep watching this space ….. it may change again. Not much today. I decided to add a ‘Top Post’ widget, but the side bar was looking a bit overlong. Enter ‘Secondary Side Bar’!!! Hmmm, I’m not too sure about this. The main body seems to be too squashed to accomodate two sidebars effectively. What does anyone think? Maybe I need to consider a different theme. One that does not have such wide side borders. Is there such a theme? Anyone have any ideas I can look at? Watch this space. As of today’s date (20/09/2014) I have a total of 154 comments on the posts I have made. My goal/aspiration is to increase this by 20% by the end of October. My ultimate goal would be to have comments on every post I make. The problem, I feel with random posts is that there is no continuity. This I believe could be the reason for the lack of comments. So the goal here is to identify a theme. One that I either have an opinion or one that I have a good knowledge of. The second goal is the easiest. Goal three would be quite a challenge, but could, if done well help achieve goal number 1. I have been toying with the idea of changing my blog theme for some time. But getting around to it, has been another story. Getting right and more important, readable takes a little bit of effort. This one is the fourth one I have tried today, and I think I will use this for the time being. It’s named “Twenty Ten” and I know it’s now Twenty Thirteen, but nobody has done that theme yet (well not that I can see) and until they do, Twenty Ten it is.